Location: Dame Street, Dublin, Northern Ireland. Notes: Dublin Castle off Dame Street, Dublin, Ireland, was until 1922 the seat of the United Kingdom government's administration in Ireland, and is now a major Irish government complex. Most of it dates from the 18th century, though a castle has stood on the site since the days of King John, the first Lord of Ireland. The Castle served as the seat of English, then later British government of Ireland under the Lordship of Ireland (1171-1541), the Kingdom of Ireland (1541-1800), and the United Kingdom of Great Britain and Ireland (1800-1922). After the signing of the Anglo-Irish Treaty in December 1921, the complex was ceremonially handed over to the newly formed Provisional Government led by Michael Collins. 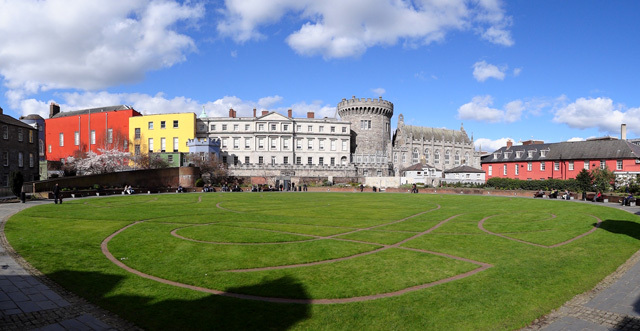 Dublin Castle has appeared in numerous films including Barry Lyndon, Michael Collins, Becoming Jane and The Medallion, as well as the television series The Tudors, where it doubles as the Vatican in the pilot.